Talking about the continents with children learning Spanish lets you introduce or review geography vocabulary. In addition to the word continente and the names of the continents, you use words words like tierra, mar, océano, país, ciudad, costa, población, superficie, norte, sur, este and oeste. 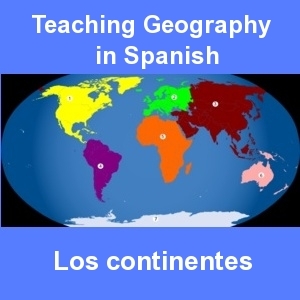 There are many online resources to make teaching the continents in Spanish easier. This song is an easy way to teach the pronunciation of the seven continents in Spanish. My students are always surprised to learn that different countries teach different numbers of continents. In the U.S., we teach that there are seven. However, in Latin America and some European countries students learn that there are six continents. North and South America are combined as the continent of America in the six continent model. There is also the five continent model which only includes inhabited continents. This model is the basis of the five rings used as the logo of the Olympic games. Here is a rap and video in Spanish about the number of continents. It explains the models and repeats the names of the continents several times.